While hotels are often sold out during the high season, there are a number of private apartments on offer for daily, weekly or monthly rental. 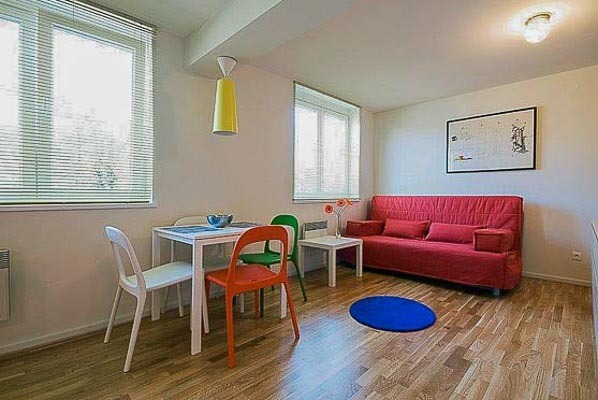 Here we bring you a selection of well-maintained Ljubljana apartments for rent. This chapter is also our answer to frequent questions on where to find cheap apartments for rent in Ljubljana. 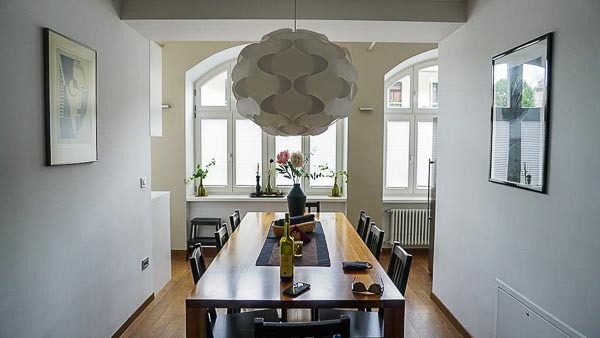 This beautifully restored luxurious apartment in the centre of Ljubljana is sited on the first floor of a 500-year-old restored building with only one flight of stairs. It sleeps eight people in two dedicated bedrooms and a large living room. There are a fully equipped modern kitchen, washer, dryer and dishwasher, plus a garage to park your car. Cook by yourself or enjoy a full buffet breakfast (not included in rental price, but very reasonably priced) in a cafe just down the hallway. The location is perfect. It’s right next to the city centre (3-minute walk), a 4-minute walk from the National Gallery and in a walking distance to all major attractions and the old town centre. Main train and bus station are within a short walking distance. Recommended for friends getaway, families or older travellers. In the very heart of the old town of Ljubljana lies a unique, luxurious penthouse apartment embedded in the castle hill of Ljubljana. It consists of a large room with bathroom, kitchen, and a garden providing a spectacular view of Ljubljana and the castle. 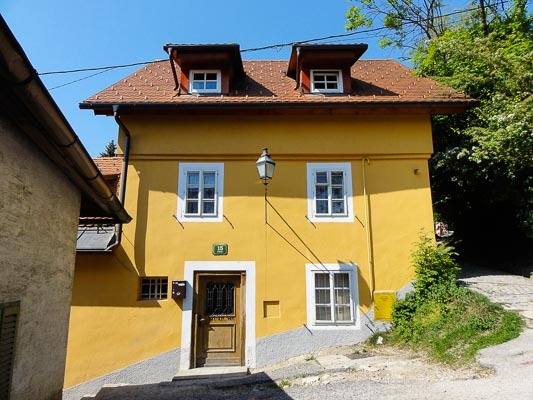 The property is only 200 m from the Ljubljana Castle and is accessible by car. 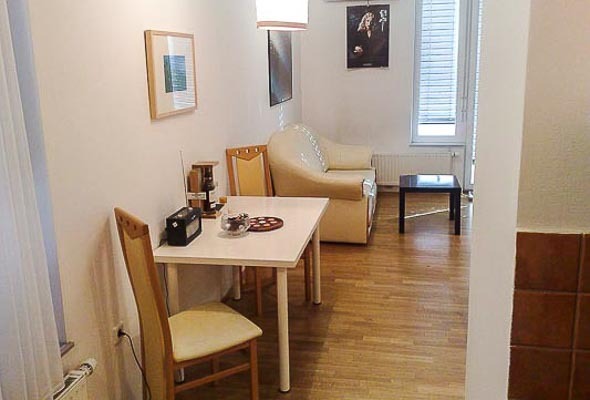 If you are in search of a house for rent in Ljubljana, this is an excellent option. 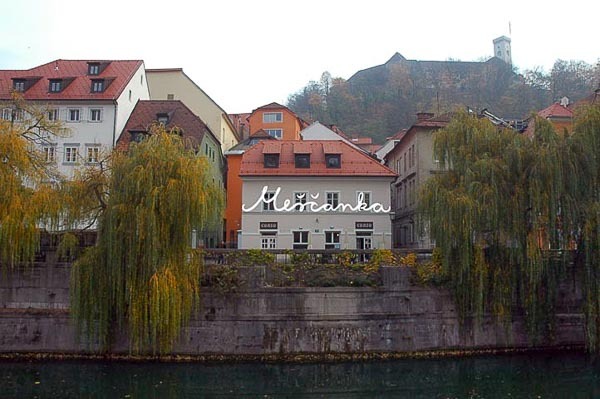 Located by the river, beneath the castle and between the two central bridges of the old town, Mescanka Apartments (pronounced ‘Meshchanka’, meaning City Lady) offer you the perfect place to stay and to discover Ljubljana. All the flats are cosy, clean, spacious and have private bathrooms, most of them a kitchen as well. 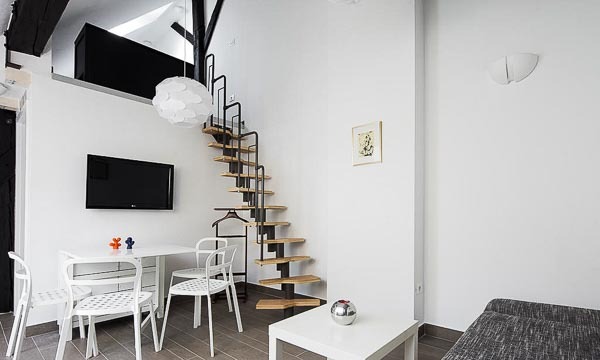 They were completely renovated in 2011 to blend a great mix of old refurbished furniture and modern interior design. Each flat is named after an important and independent woman from Ljubljana`s history. You will find Kollmann Apartments in the very centre of Ljubljana Old Town overlooking the river. 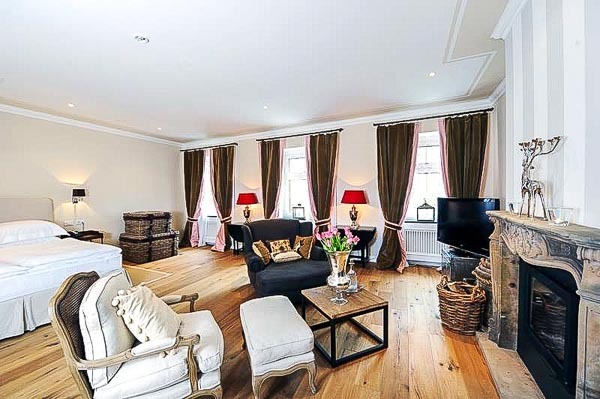 Two stylishly furnished apartments in a traditional old townhouse offer you a relaxing stay. The smaller romantic studio is suitable for 2-3 guests., while the larger apartment is suitable for up to 8 guests and has a magnificent view of the Ljubljanica river promenade. The apartments are air-conditioned and have fully equipped kitchenettes. Each offers a bathroom, free wireless internet access and cable LCD television is also provided. Cobblers` Bridge is just beside and many other city attractions are a short step away. City center is the best area to stay in Ljubljana. This beautiful apartment is placed in the heart of the city, within walking distance of most city sights. A station for city buses is near and Ljubljana food market, tourist information centre and restaurants and cafes are right there, the castle funicular is just around the corner. The apartment can sleep up to 6 people. It is fully equipped with flat screen TV, free Wi-Fi, dishwasher, washing machine, fresh bed linens and towels. Rooms are spacious. Windows are soundproof so a quality of sleep is not in question. 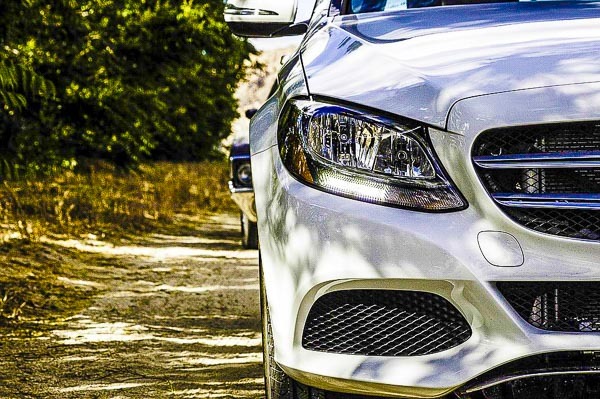 Public parking is possible nearby (reservation is needed) and costs EUR 25 per day. The premises are non-smoking. 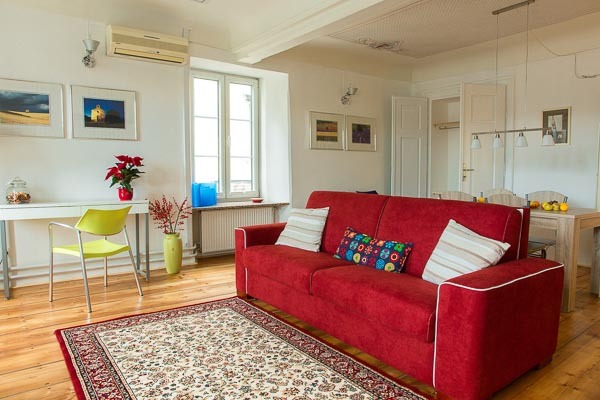 This unbelievably charming SweetHome apartment is located in the centre of Ljubljana. The warmth and comfort are special, the apartment is well looked after, very well furnished, with real attention to details. Restaurants, pubs, bakeries and other stores are pretty much on your doorstep. National Drama Theatre of Ljubljana is about 300 m away and most sights are within a 10-minute walk. Sweethome is perfect for two persons, but an extra bed for a third person can be added. They supply also cot and highchair for small kids. This beautiful recently renovated villa offers quality, relaxing and affordable accommodation. 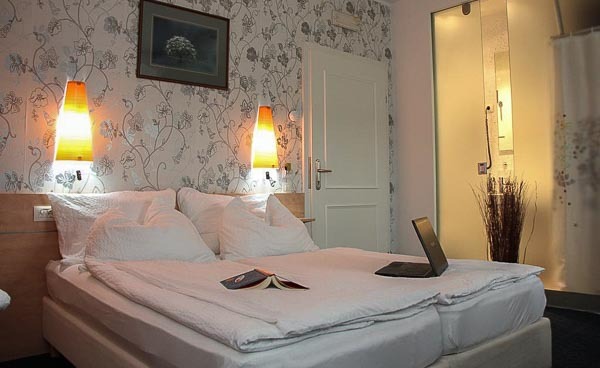 It is located 4 km out of the city center and easily accessible from the highway ring and thus perfect for those catching a flight at the Ljubljana Airport or travellers who wish to explore other parts of the country beside the capital. There are four fully equipped twin-bed rooms and eight apartments of various sizes appropriate for leisure, business travellers or families. Parking is free, coffee also, pets are welcome and WiFi goes without saying. 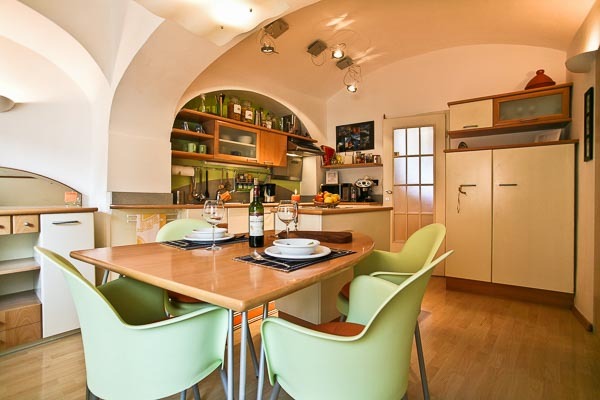 It definitely makes one of the best value-for-money choices of accommodation in Ljubljana. Marta Studio offers comfortable rooms and apartments in the urban house, which lies about 15-20 minutes walk from the city centre. It offers 3 large rooms (suitable for 2) and an apartment for 4-6 people. There is a bus station in front and a supermarket three minutes away. Parking is free and available in front of the house. Taxi to the city centre will cost you around 4 €. This modern apartment on quiet Kolodvorska Street offers direct access to the historical centre with main visitors attractions 5 min walk away, main bus and train station is 3 min walk away. The apartment has a separate bright bedroom with a double bed and a writing desk, a small living room with a sofa (sleeping 1 extra person), a balcony and a fully equipped kitchen. hairdryer, air-conditioning, CTV and free Wi-Fi internet access available. The apartment is sited in a modern building on the 4th floor with elevator access. There is an underground garage and pets are allowed. centre. 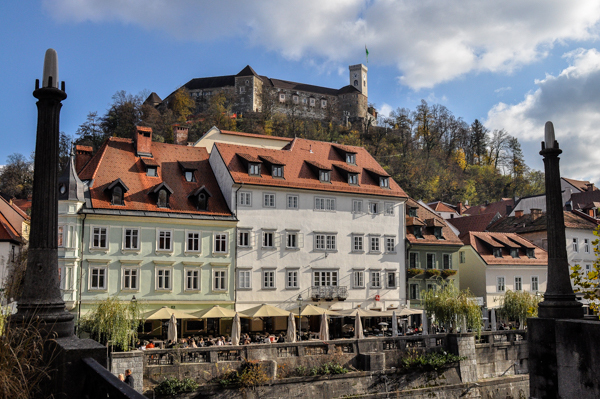 It is situated on Ljubljana’s favourite riverbank promenade, which is filled with cafes, restaurants and bars. The central market is across the river, the main Preseren Square with the Triple Bridge is 100 meters and the Dragon Bridge 50 m away. Sleeping options include 2 fully furnished apartments and a double/twin room. 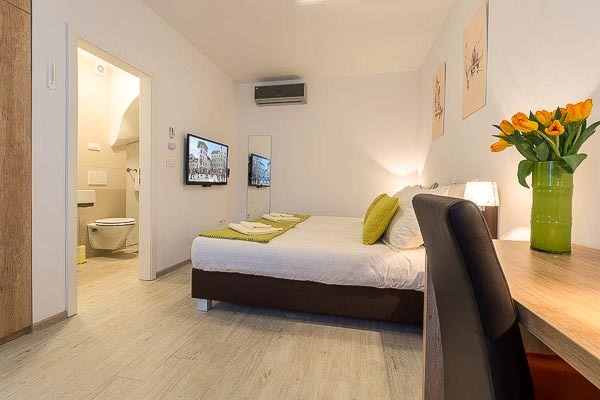 All units come with an en-suite bathroom, air-conditioning, LED TV, free and unlimited WI-FI. safe, complimentary coffee and tea. Apartments have fully equipped kitchen, while the room has a mini-fridge. The extra bonus is a common outdoor patio where you can relax. There is also a souvenir shop on the premises. The apartment has a separate bright bedroom with a double bed and a writing desk, small living room with a sofa (sleeping 1 extra person), a balcony and a fully equipped kitchen. The apartment is sited in a modern building on the 4th floor with elevator access. There is an underground garage and pets are allowed. Where to find Ljubljana apartments for sale? 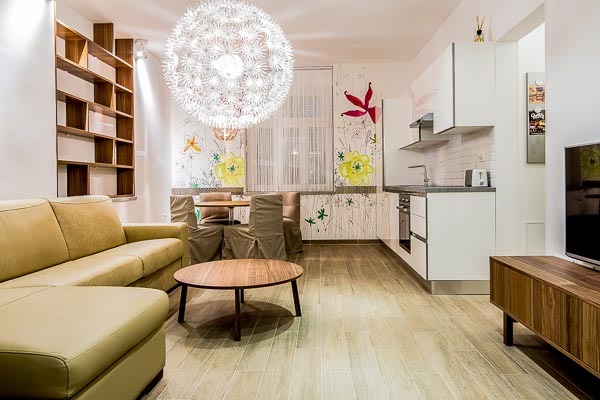 What about Slovenia apartments for rent? Are there Ljubljana apartments for long term rent?